We can never get enough of the 70’s hippie glamour. A vibe so cool that never seems to go out of style. Flowing maxis, across-your-forehead headbands, flower crowns, gladiators, ankle length boots and much more. Let’s talk about boho bags that on their own can transform the vibe. 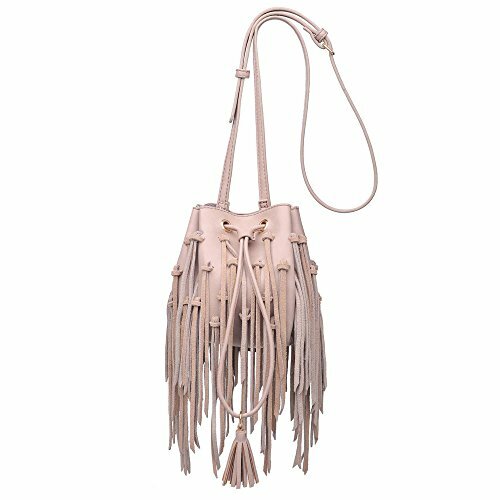 Check out these 10 Best Boho Bags and channel your inner hippieness with tassels, fringe, and distressed leather bags. If it’s the boho-chic look that you aspire, this bag can help you achieve that. What we like about the bag is the fringes starting with the knots falling on uneven lengths. They lend a cool vibe to this bag. Buy This Now. This bohemian hippie bag made out of 100% cotton rope will inspire you for that beach vacation. Pair this feel-good boho bag with a casual dress on a normal day to add some zing. When not using it as a bag you can hang it on the wall and it makes for a beautiful macrame tapestry. Buy This Now. Bohemian messenger bags are one of those timeless trends that never go out of fashion. Rightly so, for these bags are as functional as stylish. This particular bag functions as both a boho cross body bag as well as a messenger hand bag. It’s big enough to fit a 13-inch laptop, A4 magazines, books, iPad, cell phone, wallet, documents, umbrellas and other important things. Buy This Now. Super chic and dyed in a special dip-dye texture, this leather boho bag is a take on the traditional bucket bag. It has a removable single top strap (perfect for slinging in the crook of your arm) and also as acts as a boho cross body bag. It has a drawstring closure at the top with an adjustable long strap. Buy This Now. Handmade by Artisans this boho bag has unique patchwork tapestry. The mirrors pom-poms and tassels complement the woven patchwork. The thick quilted cotton fabric is double stitched for lasting durability and strength. This spacious bag can fit a large laptop, iPad, books and more. Buy This Now. This bohemian leather handbag gives off the perfect boho vibes. It is not only adorned with tassels but also has beads, sea shells and other embellishments. It’s exterior is made of 100% leather and is perfect for daily use as it is pretty big to hold necessities. Buy This Now. We love this small boho bag created from soft suede with a beaded metal fringe. The embroidery on it lends a perfect contrast to its maroon color. It has two zipped pockets and a detachable long strap drop helping you to use it as a shoulder bag or a boho crossbody bag. You can wear it with a boho dress to complete the look. Or wear it with a casual dress for that little boho touch. Buy This Now. Made by hill tribes of Lanna region in Northern Thailand, this 100% cotton bag has exquisite embroidery. Featuring a zippered opening area and inside zippered pocket, it is a large size bag. The mixed pattern of embroidery and the hanging pom poms lend it the boho vibe. Buy This Now. This Crossbody Bag is made with hemp fabric and vintage Hmong hill tribe embroidery. Colorful pom pom decorations around a single color fabric make this one stand out. Pair it with a boho dress and you’re sure to get admiring glances. Buy This Now. Made in Colombia this ethnic handwoven bag will add to your casual boho look. The beige, red and black compliment each other in this boho bag. The red pom poms just add that right splash of color. Buy This Now.